Traveling via a donated charter flight, Lou-Seal — the gray seal rescued in Bermuda on March 19 — has arrived at the Mystic Aquarium in Connecticut where they plan to continue her rehabilitation, with the goal of releasing her in the colder waters of the northern Atlantic Ocean. “After receiving care from the veterinary team and staff at the Bermuda Aquarium, Museum and Zoo [BAMZ] the female gray seal, named Lou-Seal by public supporters in Bermuda, arrived in Connecticut via chartered flight for continued rehabilitation at Mystic Aquarium’s Animal Rescue Clinic, with the goal of releasing the animal in the colder waters of the northern Atlantic Ocean,” a spokesperson explained. “We have many years of experience caring for gray seals in our Animal Rescue Program, so we are very familiar with the species; however, this will be the first time that we provide care to an adult gray seal in the clinic,” said Mystic Aquarium’s Animal Rescue Program Manager, Janelle Schuh. The seal was rescued off of a rocky shoreline near Tobacco Bay, St. George’s, Bermuda by BAMZ on March 19. It is believed to be the first case of gray seal in Bermuda. Upon admittance, the seal was found by veterinarians to be emaciated with multiple small wounds, nasal discharge and dehydration. The rehabilitation posed distinct challenges for BAMZ and its unique patient. 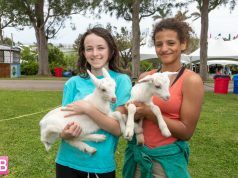 While BAMZ continually provides excellent husbandry and veterinary care to its animals, the facility lacks the required quarantine space to care for large marine mammals for any length of time. Additionally, the primary diet for the gray seal had to be imported to Bermuda and the amount increased rapidly as she began to improve clinically. 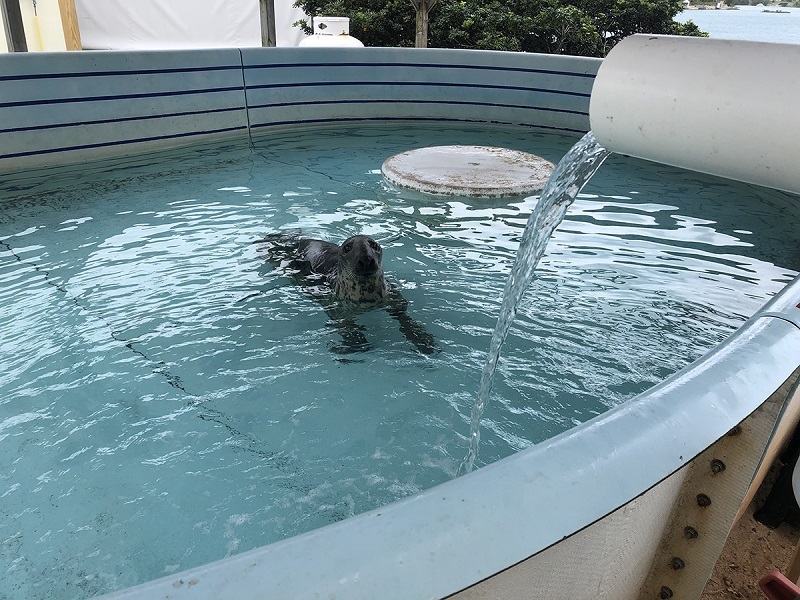 Dr. Ian Walker, Head Veterinarian and Principal Curator of BAMZ, Patrick Talbot, Curator of Aquarium and Zoo, and the rest of the team at were up for the challenge and after weeks of first-class care, Lou-Seal showed marked improvement. 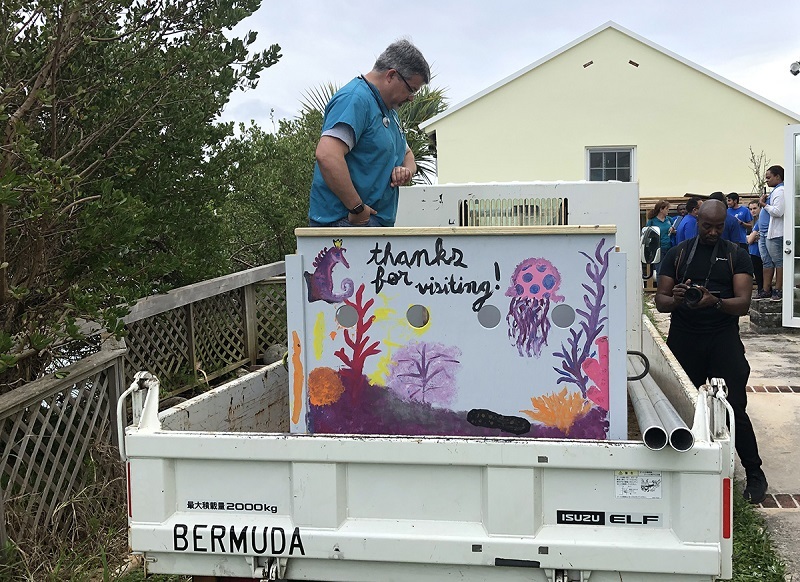 “The simple fact that this animal was able to cross the open ocean, through winter storms, with nothing to eat, and find the one miniscule piece of land in the Atlantic Ocean, where she could actually receive rehabilitative care, is miraculous,” said Mr. Talbot. 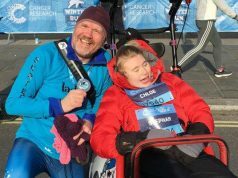 The duo was also quick to credit local support in the effort as well. During her stay, Lou-Seal became somewhat of a celebrity; garnering the love and support of local citizens who pitched in with donations to support her care. One local establishment not only collected donations, but also purchased the restaurant-quality herring required for the recovering seal. “It is the continued collaboration by local, regional and national companies, as well as international agencies, that made the transport to Mystic Aquarium possible,” said Dr. Walker. The requirements of animal care and safety, marine mammal protection, customs, immigration and more, were collaboratively addressed and coordinated by NOAA Fisheries, US Fish and Wildlife, Bermuda’s Department of Environment and Natural Resources the US Consulate and Customs and Border Protection in Bermuda. 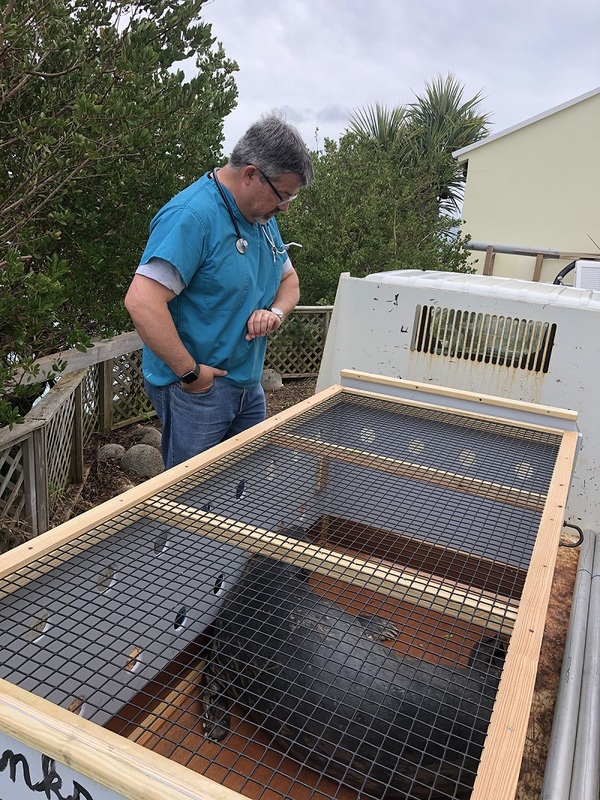 “The U.S. Consulate is very pleased to be a part of the safe transport of Lou-Seal from Bermuda to Connecticut. 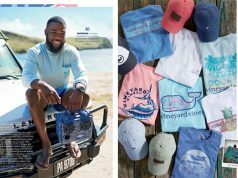 With the support of our Consular Section and Customs Border Protection officers, we were able to connect Dr. Ian Walker with the appropriate authorities to ensure all required documents and protocols were arranged to facilitate Lou-Seal’s travel,” said U.S. Consul General to Bermuda Constance Dierman. On Wednesday, Canadian-based Cargojet donated a chartered flight to transport the gray seal from Bermuda’s airport to Newark Liberty International Airport in New Jersey. “Cargojet is delighted to play a part in the relocation efforts of Lou-Seal from Bermuda to Newark, New Jersey for furtherance to Connecticut. We are happy to hear she is resting comfortably in her new temporary home before being released,” said Gord Johnston, Senior Vice President, Sales Cargojet Airways. Cargojet is Canada’s leading provider of time-sensitive air cargo services; operating networks across North America. 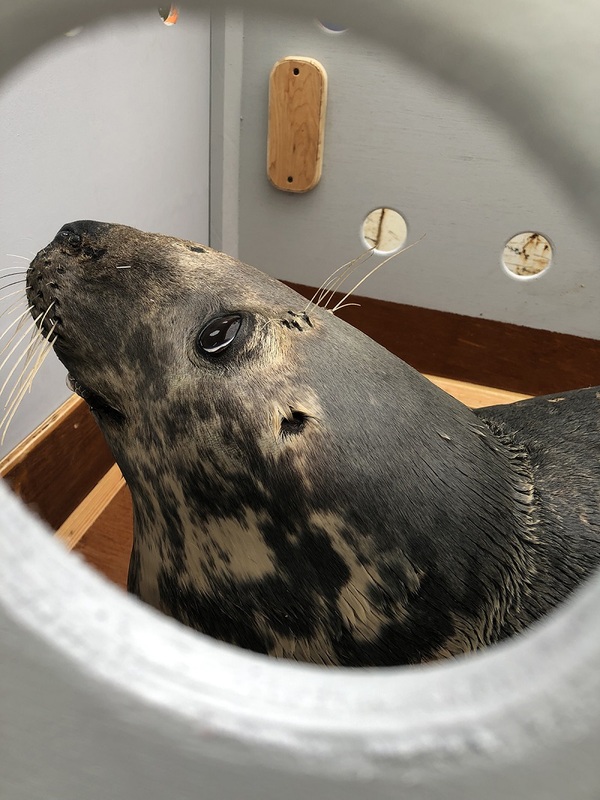 After Lou-Seal cleared inspection with US Fish and Wildlife Service, Mystic Aquarium veterinary and Animal Rescue Program staff drove her back to Mystic’s Animal Rescue Clinic. Upon arrival, Lou-Seal was admitted to the Clinic where she will receive continued care from animal care professionals with the goal of increasing her body condition to a healthy weight, maintaining proper red and white blood cell counts and ensuring all her wounds have healed – all in preparation for release in the coming months. The seal will remain at Mystic Aquarium until it is deemed healthy and then will be released back into her natural habitat.